Clinicians working with patients with head and neck cancer need to educate and instruct patients and families pre- and post-surgery to maximize functional outcomes and improve quality of life. 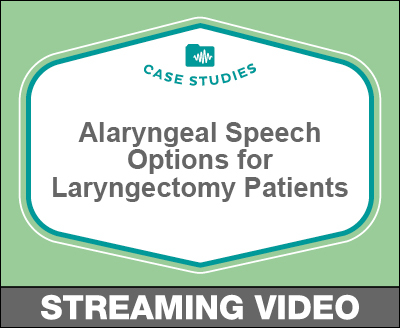 To adequately do this, SLPs must know—and be able to explain—the basic alaryngeal speech options available to patients who have undergone laryngectomies. In this session, Barbara Pisano Messing will go over the basics of the three primary types of alaryngeal speech, using anatomical illustrations and video interviews with individuals who have undergone laryngectomies and who use each of the voicing methods. Walk away with resources to share with patients and to use yourself, including an outline of key points for preoperative counseling and post-surgery alaryngeal speech rehabilitation, a glossary, FAQs, and more.